Snoqualmie Valley Women in Business - SparkFire, Inc. 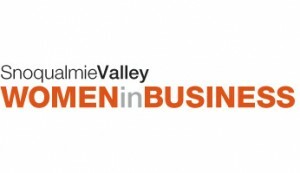 The Snoqualmie Valley Women in Business is a vibrant group of women united in the purpose of collaboration, networking, community leadership, and professional and personal growth. During her “Create with Fire” keynote, SparkFire founder Chris Fagan ignited conversations about new ways of working and living. She reminded the group that to thrive in the 21st century, we must embrace the idea that creativity is everyone’s business. In fact, creativity is a portal for transforming our world for the better — a movement building in momentum within business, education, and life. Through her interactive presentation style and energetic personality, Chris left the audience feeling energized and ready to apply the four key “Create with Fire” principles to business, and life. See more of what audience members had to say about Chris’s talk here.